Dexter Daily: Michael C. Hall: "There's a Desire to Conclude the Story But Also Leave Room For Speculation"
Michael C. Hall: "There's a Desire to Conclude the Story But Also Leave Room For Speculation"
via The Los Angeles Times: For more than 10 years, first as a closeted funeral home director on Alan Ball's "Six Feet Under," then as the coolly charming psychopath at the center of Showtime's "Dexter," actor Michael C. Hall has demonstrated a skillful facility with characters who conceal their emotions — or lack thereof — from even those closest to them. Lately, Hall's talent for guarding dark secrets has become an invaluable asset. With "Dexter" set to conclude Sunday after an eight-season run, questions have begun to swirl over the fate of the blood-spatter analyst who's cut a murderous swath through Miami. Hall's deflected them all with a knowing, mischievous smirk. "There is a desire to bring the story we've been telling to some sort of conclusion but also leave some room for speculation," Hall said, sipping peppermint tea at a downtown gastropub just days after shooting the finale. "I don't think we're going to be able to have an ending that's pleasing to everyone, nor should the ending necessarily be pleasing. But I'm happy with it." Read the rest of the article, below. The privilege of charting out an actual ending to a series is relatively new in television, thanks to the rise of the more ambitious and sophisticated storytelling afforded by cable television. Once, a show's conclusion was at best hastily assembled, tied almost solely to the whims of ratings and network executives. Now, for an increasing number of programs, including AMC's "Breaking Bad," which wraps up Sept. 29, a show's final notes are often in the hands of the show runner. "Dexter" arrived in 2006 as part of a wave of compelling television antiheroes heralded by James Gandolfini's Tony Soprano and Michael Chiklis' Vic Mackey on "The Shield." The show, adapted from Jeff Lindsay's crime novels, tapped into the popularity of police procedurals and the modern fascination with killers. Yet the series marked the first time that audiences were asked to root for a protagonist who ritualistically stalked, then stabbed his victims — and then brought doughnuts to the office in the morning. That gamble paid off, Hall said, largely thanks to Dexter's "code" — his victims, usually, are criminals who have escaped justice — as the key "loophole" that could give viewers permission to root for the character. The show's deft use of black comedy helped too. "Early on I noticed that people would, when they talked about the show, confess to having had misgivings about liking it," Hall said. "At some point people were saying that less, and were more like, 'Way to go, Dex.' He'd somehow won people over." "Dexter" has amassed its own ardent following — its eighth season debuted to 2.5 million total viewers, a record season premiere for Showtime. Critics initially championed the series, praising Hall's nuanced performance, which has earned him five Emmy nominations. 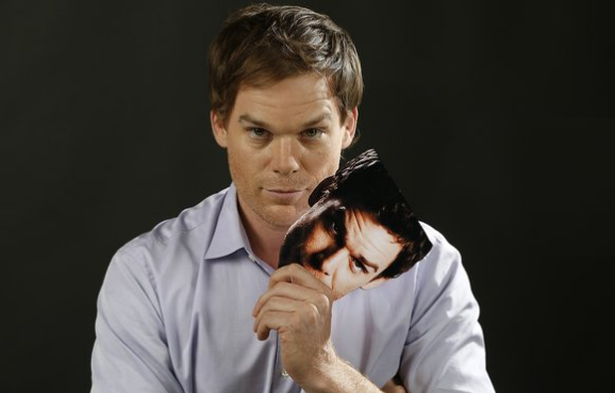 The North Carolina native played Dexter as both a lost soul at the mercy of his basest instincts and a deadly predator. Reviewers became less enthusiastic over time, with the sixth season, featuring Colin Hanks as Dexter's nemesis, widely criticized as the nadir of the series. As the finale opens, Dexter's decision to spare another serial killer appears to have had potentially lethal consequences for his adoptive sister, Deb (Jennifer Carpenter). With a hurricane settling over the region, it's unclear whether Dexter will manage to slip out of Miami alive with his lover Hannah (Yvonne Strahovski) and young son, Harrison. "People have been asking me, 'How do you feel?'" Hall said. "I haven't really known what to say in any concise way. I'm starting to feel like I'm just now coming to terms with everything I've simulated. I've felt this bubbling up of, Oh, god, what have I done?" There's no question the role has marked a significant chapter in Hall's life on- and off-screen. During its run, the graduate of New York University's prestigious Tisch School of the Arts was diagnosed with Hodgkin's lymphoma, a cancer that affects part of the body's immune system. He was successfully treated. He also married and divorced Carpenter; their roughly two-year union ended amicably. Carpenter said Hall had an "intuitive understanding" of the character and that she and Hall shared a profound connection from the start. That helped them to keep their personal lives separate from their work on the series. "The only way that it truly informed it was that I know him," she said. "I know that if I asked him for something that I needed to try something a certain way that he would see me and hear me and that he could do the same with me." Now that the time has come to leave Dexter behind, Hall said he's ready, though he hasn't exactly abandoned dark, challenging material. He'll next be seen in "Kill Your Darlings," playing the ill-fated David Kammerer in the 1940s-set tale. The film, which premiered at the Sundance Film Festival in January and is set to open in October, centers on a real-life murder case that touched the lives of Beat greats Allen Ginsberg, Jack Kerouac and William Burroughs. He's also set to star alongside Sam Shepard in "Cold in July," director Jim Mickle's adaptation of the Joe Lansdale revenge novel about a man who shoots a burglar and finds his life in danger. "I've been taking jobs that have a definite beginning, middle and end going in as opposed to this open-ended, soul-encompassing treks into the unknown," Hall said. "I'm getting too old to make those commitments. "It feels nice just to go focus in on that and remind myself that acting and playing Dexter aren't totally one and the same thing."